Childress takes a deep look at Bigfoot Nation—the seemingly real world of bigfoot around us in the United States and Canada. Whether real or imagined, that bigfoot has made his way into the American psyche cannot be denied. He appears in television commercials, movies, and on roadside billboards. In fact, bigfoot is everywhere, with actors portraying him in variously believable performances and it has become the popular notion that bigfoot is both dangerous and horny. Indeed, bigfoot is out there stalking lover’s lanes and is even more lonely than those frightened teenagers that he sometimes interrupts. Bigfoot, tall and strong as he is, makes a poor leading man in the movies with his awkward personality and typically anti-social behavior. He doesn’t care a skunk’s gland how many movies or commercials are made about him without any royalties whatsoever being paid. To him, Bigfoot Nation is all about style, a lifestyle—shall we say—that keeps bigfoot on the fringes of society, gently creeping into our dreams. 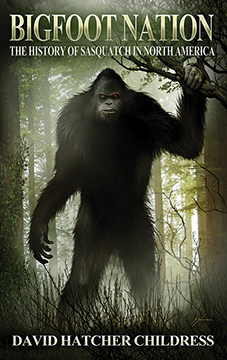 Join David on a wild ride from the very first bigfoot reports in the 1800s to right now. Chapters include: 1800 to 1899: The Wildmen of the Frontier; The Oldest Bigfoot Photo; 1900 to 1940: The 20th Century Begins; 1950 to 1999: The Heyday Years; The Skunk Apes of Swamp Nation; Bigfoot in New Mexico and Arizona; 2000 to 2020: Post-Millennial Bigfoot, more. Includes 16-pages of color photos that document Bigfoot Nation! BIGFOOT NATION: A History of Sasquatch in North America By David Hatcher Childress. 320 Pages. 6x9 Paperback. Illustrated. Color Section. Bibliography. Notes.